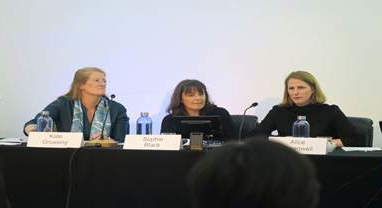 As part of a Women’s leadership distinguished speaker series, Kate Grussing, Managing Director of Sapphire Partners, joined a panel of experts at Cass Business School to discuss sensitive issues affecting women in the workplace a few days before the topical gender pay reporting deadline. The panel was moderated by Artis Kakonge, inaugural Cass MBA Global Women’s Leadership Scholar, other panellists included Alison Maitland, co-author of Why Women Mean Business and a former Financial Times Journalist and Catrin Lewis, a barrister specialising in employment and discrimination law at Garden Court Chambers. Sapphire Partners partnered with City & Financial Global for the second year for a one-day conference, at which Kate Grussing, Managing Director of Sapphire Partners joined an exceptionally strong speaker panel. The conference will examined the role of the Government and financial regulators in addressing the imbalance of seniority between genders and determine what can be done to identify the barriers to women entering and progressing in the financial services sector. It also reviewed the progress made since the launch of the HM Treasury’s Charter and assessed the impact the Charter has had on signatory companies, the benefits they are realising and the challenges the firms face in meeting their Charter commitments. Sapphire Partners are co-hosting a roundtable breakfast with Reed Smith to provide the opportunity to engage directly with the FRC and provide feedback to the proposed revisions to the UK Corporate Governance Code ahead of the consultation period ending 28 February 2018. Discussions will include proposed Section 3 changes: Are they sufficient and justified in order to build diversity in the boardroom and the executive pipeline; How might the Nominations Committees discharge their wider remit and practical implications, potential costs and burdens of extending the Hampton-Alexander recommendation beyond the FTSE 350 and encouraging companies to report on levels of ethnicity in executive pipelines. Sapphire MD Kate Grussing has the honour of moderating a panel of 4 prominent women in finance in Paris on 6 October discussing what the best firms are doing to make greater progress in leveraging their female pipeline. Sapphire Partners co-hosted our second annual awareness raising event for female students and recent graduates interested in working in fund management, this year in collaboration with M&G Investments. Key note speaker, Anne Richards, CEO at M&G Investments shared her personal career journey and the challenges she overcame. A panel discussion shared their experiences and explored how you can build a career in the investment industry. 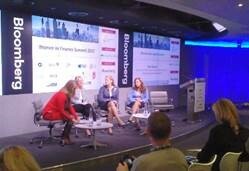 The panel was moderated by Dame Helena Morrissey (Chair of the Diversity Project and Head of Personal Investing at LGIM), other panellists included: Sian Morgan, AllianzGI; Helen Driver, Aviva Investors; Shruti Khandekar, HSBC; Jennifer Gillespie, LGIM; Jenny Rodgers, M&G Investments; Alix Stewart, Schroders and Yolanda Courtines, Wellington Management. Kate Grussing, MD of Sapphire, was the catalyst behind the event. Kate Grussing, MD of Sapphire Partners will be a panellist on “How diversity has enabled innovation” held at the London Stock Exchange. The panel will be facilitated by Tanuja Randery, other panellists include Fiona Hathorn, CEO, Women on Boards and Beatrice Bigois, Managing Director, EDF Energy. Xaviet Rolet, CEO, London Stock Exchange will open the comments with his story on the transition journey he has been on with the LSE, followed by Lindsley Ruth, CEO, Electrocomponents. 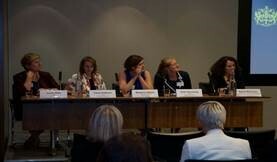 Sally Springbett, Director of Sapphire Partners, was a panellist at the WiTT-FDM event: Addressing the IT Skills Gap. In 2016, the World Economic Forum published a report on The Future of Jobs from companies across nine industry categories covering 15 of the world's largest economies. The general agreement following this report was that the Fourth Industrial Revolution, which includes developments in fields such as artificial intelligence and machine-learning, robotics, nanotechnology, 3-D printing, and genetics and biotechnology, will cause widespread disruption over the next five years. WiTT board director Michelle Senecal led the panel in a discussion of these issues along with Sheila Flavell, Yvonne Gallagher, Felizitas Lichtenberg and Trudy Norris-Grey. 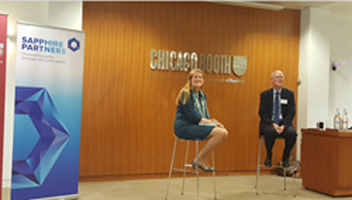 Sapphire Partners hosted a reception at The University of Chicago Booth School of Business to celebrate the publication of Nick Lovegrove’s the Mosaic Principle. The evening included a discussion with the author, Nick Lovegrove, Managing Partner at Brunswick Group. Sapphire Partners is partnering with City & Financial Global for this one-day conference, at which Kate Grussing, Managing Director of Sapphire Partners will be a panellist. Until now EU policy has tended to dominate much of the debate about financial services remuneration in the UK. With Brexit, this will begin to change, and the regulatory environment outside Europe will need more attention. Compensation, Reward and HR managers still have plenty of new UK rules about which to worry, In addition, there is a growing focus on socially related areas such as gender pay. This conference will be the eleventh in this series and will examine the detailed challenges and it will try to take both a short and long term view. Kate Grussing, MD of Sapphire Partners, attended the Chartered Management Institute’s event ‘Men as Role Models’. Eleanor Mills, Editorial Director at the Sunday Times, chaired a panel discussion to explore how men act as role models in practice, and how we prompt more men to become everyday champions of women at work. Speakers included Ann Francke, CMI’s CEO, Chris Stylianou – Chief Operating Officer (UK & Ireland), Sky, Martin Steadman – CEO, Nutmeg, Mark Wild – Managing Director, London Underground and Michael Lewis – CEO, E.ON Climate & Renewables. Sapphire Partners partnered with City & Financial Global for this one-day conference, at which Kate Grussing, Managing Director of Sapphire Partners was a panellist. Until now EU policy has tended to dominate much of the debate about financial services remuneration in the UK. With Brexit, this will begin to change, and the regulatory environment outside Europe will need more attention. Compensation, Reward and HR managers still have plenty of new UK rules about which to worry, In addition, there is a growing focus on socially related areas such as gender pay. Sapphire Partners held their fourth annual reception to put the spotlight on “Women to Watch”, This year it was in collaboration with Royal Mail. The reception was hosted by Moya Greene, CEO, Royal Mail. Speakers included Sir Philip Hampton, Chair of the Hampton-Alexander Review and GlaxoSmithKline and Kate Grussing, MD of Sapphire. Sapphire Partners co-hosted this event for female interns and recent graduates who were progressing or considering a career in Fund Management, in collaboration with Legal and General Investment Management at their latest 50/50 by 2020 network event. Key note speaker, Lucy MacDonald, CIO Global Equities at Allianz Global Investors shared her personal career journey and the challenges she overcame. 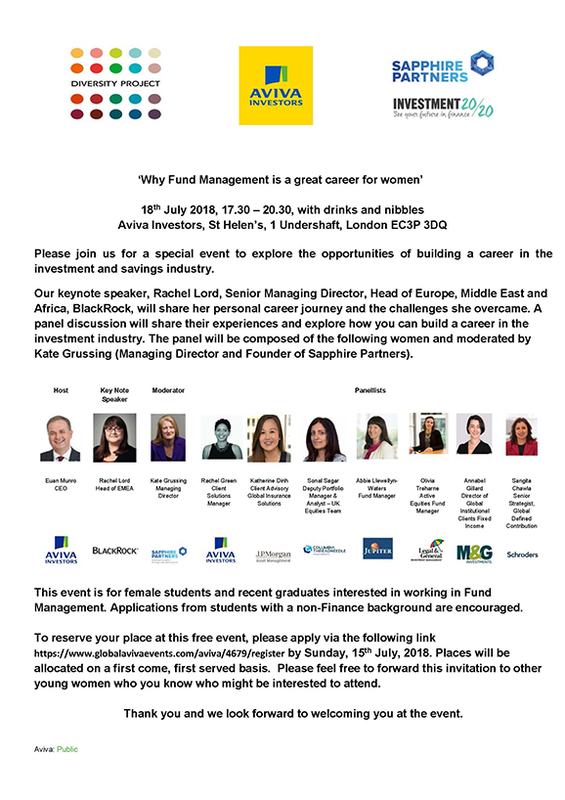 Careers advice was also heard from an inspiring panel of fund managers from across the investment community. Panellists included: Sarah Aitken, LGIM; Esther Chan, Ashmore; Fiona Hagdrup, M&G; Melissa Platt, Mondrian; Eve Finn, LGIM; Charlotte Harington, Fidelity and Ella Hoxha, Wellington Management. Kate Grussing, MD of Sapphire, was the catalyst behind the event. Sapphire Partners proprietary research on board composition of the London Stock Exchange’s 2015 premium listed Initial Public Offerings was launched at an event hosted by Numis Corporation. Speakers included Lorna Tilbian, Executive Director, Numis Corporation, Cathy Turner, Independent NED, Aldermore Group and Countrywide, and Kate Grussing, Managing Director of Sapphire. Sapphire Partners held their third annual reception to put the spotlight on “Women to Watch.” This year it was in collaboration with the London Stock Exchange Group plc. 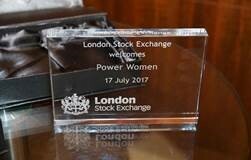 The reception was hosted by Xavier Rolet, Chief Executive, London Stock Exchange. Speakers included Moya Greene, Chief Executive, Royal Mail Group, Harriet Baldwin, MP, Economic Secretary to the Treasury & City Minister and Kate Grussing, Founder of Sapphire. Sapphire Partners, Kings College London and KPMG are holding a research launch “Opening the Black Box of Board Appointments: Men’s and Women’s Routes to the Boardroom”, which is a path-finding report co-sponsored by Sapphire Partners and the ESRC. With the appointment of women to FTSE100 and FTSE250 boards gaining pace, there is still little known about how men and women experience the search for Non-Executive Directorships and the appointment process. This research presents the findings of longitudinal interviews and an online survey with men and women seeking commercial board appointments. Sapphire Partners held their second annual reception to put the spotlight on “Women to Watch”, this year in collaboration with Lloyds Banking Group. The reception was hosted by Mary Macleod, MP for the Brentford and Isleworth constituency in West London. Speakers included António Horta-Osório, Group Chief Executive, Lloyds Banking Group, Nicky Morgan, Education Secretary and Minister for Women and Equalities and Kate Grussing, Founder of Sapphire. Kate Grussing was a panellist with Rona Fairhead on the realities of corporate boards at Fortune Magazine’s third annual Most Powerful Women International meeting and Gala Dinner held in London. With a programme focused on business and career success in the global economy, the 2014 theme was “The New Connected Leadership” packed with interactive sessions featuring in-depth interviews and conversations. Kate Grussing attended the launch and was one of two executive search professionals who gave evidence at a Parliamentary inquiry into Executive Women in the Workplace: Building the Executive Pipeline of Talent for Future Women on Boards. Kate testified to the importance of companies looking broader than their traditional search partners and the considerable pool of highly talented women in the pipeline. Recruitment Diary in Executive Appointment reports on Monday’s popular FT Non Executive Director’s Club Seminar on “Women on Boards: The How Not the Why.” Sapphire Managing Director Kate Grussing was quoted on the critical importance executive credentials for NED roles. Kate Grussing was the lead speaker in this workshop and talking about ‘Career Patterns and Concerns for Professional Women’. A year after the publication of Lord Davies’ review of Women on Boards, it is clear that considerable progress is being made towards increasing the representation of women on the boards. However, there is no room for complacency. Sapphire Partners were a sponsor for this all-day conference with its stellar line-up of speakers. JUMPSTART YOUR RETURN TO WORK! Sapphire Partners were delighted to again join LBS and iRelaunch to convene this pioneering and successful Return to Work Conference. Over a hundred delegates attended the conference, which was aimed at professionals who had taken a career break now wanted to return to work. There was a buzz in the room as invaluable assistance was given on strategies to return to work, successful relaunchers told their stories and hiring managers told us what they looked for in a job application. More information about the iRelaunch Return to Work Conference is here. Having a sense of humour is a key skill for any woman in business, and the content of this book, combined with the wit of its author, made this a very memorable evening. 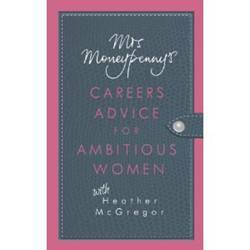 Mrs Moneypenny, in real life, is one of the best networked women in the UK and has had several very successful careers already.